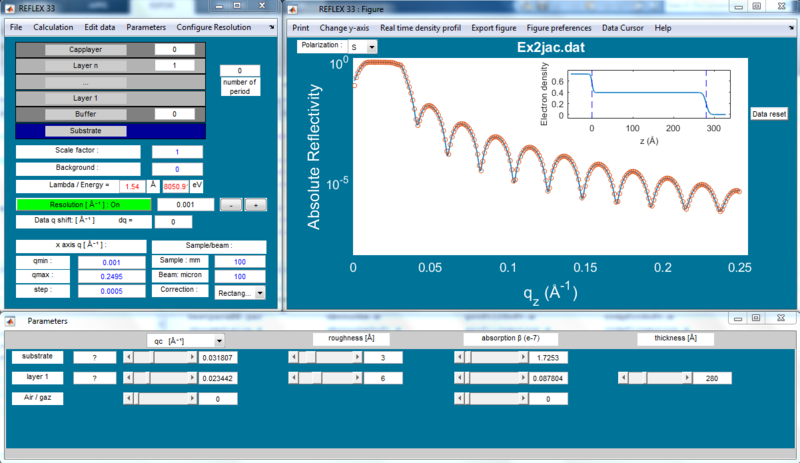 Reflex is a standalone software dedicated to the simulation and analysis of X-rays and neutron reflectiity from multilayers (implemented under Matlab but it does not need Matlab to work). The calculus for the specular reflection of neutrons is limited to non-polarised reflectivity. The frequent use of X-rays measurements by our group has motivated the development of such a tool. Reflex is not distributed with a profit-making objective but in order to share our experience in X-rays data analysis. In a typical specular x-ray reflectivity experiment, a collimated beam is impinging on the surface of a flat sample at an incident angle θ. The reflectivity (R) is measured as a function of the wave vector transfer qz which for specular reflectivity is perpendicular to the surface and is given by qz = 4π sinθ/λ. The specular reflectivity is defined as the ratio of the reflected to the incident intensity R = IR/I0 is measured as a function of increasing wave vector transfer. Reflex uses a slab-model approach with the Abeles matrix method taking into account the interfacial roughnesses of each layer together with their respective thickness and electron density . Reflex can be working as an executable file under Windows and Linux operating system. When running the program, three windows will be displayed on the screen. The top right window shows the measured and calculated refelctivity, the top left window provides essential information about the sample itself together with information about the energy of incident radiation and instrumental parameters. Finally the bottom window depends on the parameters put in the top left window and is basically providing information about the slabs constituting the stacking on the substrate. Note that the sequence always starts with the substrate and ends up with air or a fluid in contact with the sample. Since neutron reflectometry is sensitive to contrast arising from different nuclei (as compared to electron density, which is measured in x-ray scattering), qc is replaced by the neutron scattering length density (SLD) in Reflex software. The aim of this web page is to give a rapid but incomplete overview of the Reflex program. The reader interested by a more useful presentation is advised to have a look at the short manual Reflex manual. Reflex is a freeware that is available for use at no monetary cost. It is a proprietary software where the source code of freeware is not available. The compiled version for Windows and Unix are freely available for non-commercial use, and are provided as-is without any warranty regarding reliability, accuracy and fitness for purpose. The user assumes the entire risk of the use of this program and the author can not be hold responsible of any kind of problems. The author would really appreciate that any publication resulting from this program acknowledges its use by citing the following reference: . The fact of downloading and using the program implies the acceptance of the license agreement. WINDOWS : Download the latest version (Reflex35) of Reflex using the following link button. Follow the installation instructions in the Readme file. If version 9.3 (R2017b) of the MATLAB Runtime is not already installed, download it using the "Download MCRinstallater.exe button". LINUX : Download the latest version (Reflex35) of Reflex using the following link button. Follow the installation instructions in the Readme file. If version 9.2 (R2017a) of the MATLAB Runtime is not already installed, download it using the "Download MCRinstallater.zip button". Gibaud, A., & Vignaud, G. (2009). 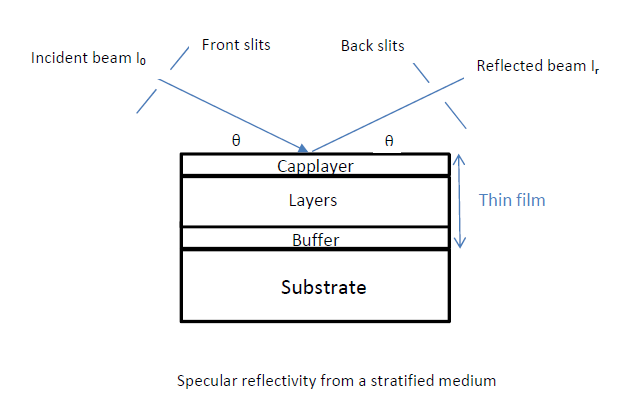 Specular reflectivity from smooth and rough surfaces. In X-ray and Neutron Reflectivity (pp. 85-131). Springer, Berlin, Heidelberg. Vignaud, G. & Gibaud, A. REFLEX: a program for the analysis of specular X-ray and neutron reflectivity data. J. Appl. Cryst. (2019). 52, 201–213.